Houseboat Bimini Tops - picking the right canvas bimini's for house boats? Houseboat Bimini Tops - picking the right bimini's for house boats? Looking at houseboat bimini tops, and how to plan or pick the right bimini's for the railings of house boats? We have a 35' Catamaran Cruiser SE - she was a victim of Hurricane Katrina. We have restored her and now she is our pride and joy. Pictures to follow when I figure out how to do it. 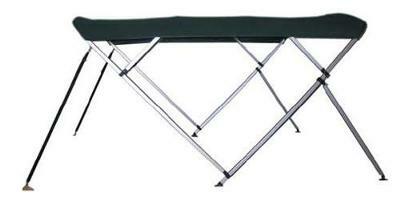 Regarding our new bimini top: it is 10 x 10 and the material is sunbrella with stainless steel 1" frame. We have custom made railing around the top of our boat which is only 1" x 17" tall anodized square alluminum. In order to get a standard height of 6' for the bimini frame, which connects to the railing, it has to be 54" tall. So, considering the untypical short size of our railing, and the weight and awkwardness of the 10 x 10 bimini, we are challenged to ensure that the railing will hold the bimini without caving it or bowing it in or out. I said all that to say this; we are very satisfied with the construction of our top railing but if you ever want to put a bimini on your railing, you may want to plan for a heavier and taller railing. You could also build the railing to be reinforced at the point where the bimini will fasten. and learn. We live on our houseboat 3 days a week - yes we are retired but refired for boating. Thanks, Capt Bob, Queen Merry (Prov 17:22), Lake Hickory NC. Well Capt Bob, I can see where you must be proud of your restoration project, and hindsight is always worth a million dollars. You're right about the railing height being an issue when it comes to installing the standard off-the-shelf bimini tops, however I have seen many folks modify them to provide a suitable flybridge sunshade. What sizes, and where to find Bimini Tops? When it comes to getting some protection from the sun or the elements, there's basically two types of bimini tops for houseboats, there's the Custom Bimini Tops, and the other is standard off-the-shelf bimini's. Lastly, hopefully some of our readers will share and post comments about their houseboat bimini top tips and experiences. Feel free to use the "Click here to post comments." link found near the bottom of this page. Comments for Houseboat Bimini Tops - picking the right canvas bimini's for house boats?